A delegate may provide editing support by instantiating an editor when update() is called with the Wt::RenderEditing flag. In that case, you will also need to implement editState() and setEditState() to support virtual scrolling and setModelData() to save the edited value to the model. 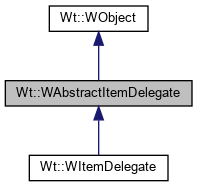 For an example, see the WItemDelegate. The item is specified by its model index, which also indicates the model. If an existing widget already renders the item, but needs to be updated, it is passed as the widget parameter. You may decide to create a new widget, in which case you are responsible to delete the previous widget if it is not reused. When widget is 0, a new widget needs to be created.